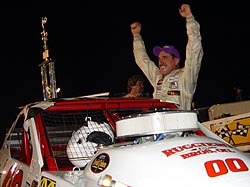 Ted Christopher swept both the Super Late Model and Modified features on Tuesday night, accomplishing something he’s talked about wanting to do for years. However, no matter how you look at it, a little bit of luck also played into Christopher’s back pocket on Tuesday night as well in both races. Not to take anything away from him, but that thought by Christopher certainly was a key to TC’s big evening. It started in the Super Late Model feature, where TC was the fifth-fastest qualifier, but started on the pole after the redraw. TC has been fast all week long in his Super Late Model, but has seemed to run of out time working his way toward the front. On Tuesday, all he had to do was keep the field behind him, which is exactly what he did. However, behind him, drivers were having their own issues, as the Super Late Model race was marred by two red flag periods in the first 10 laps for accidents that took out several big named drivers, including one accident that saw the #21 of Ryan Mathews flip down the frontstretch. After all the carnage in the Super Late Model race, TC was able to just cruise to the victory, giving him his first ever Super Late Model victory at Speedweeks. There was little time for celebration though, as Christopher had to jump into his Mod and go for a sweep of the night and his third Mod win in four nights of racing. That is exactly what he did. However, he again had a little bit of luck fall his way. After being the night’s quick qualifier, TC had to start the race sixth after the redraw. As he was working his way up through the field and picking cars off, Donny Lia’s #18 found the front of the field and started to pull away, opening up a huge lead over the rest of the competitors. However, on lap 12, Lia’s car dramatically slowed on the backstretch, allowing TC and the rest of the field to fly by him at Lia brought the #18 into the pits. Christopher grabbed the lead, held off a late charge from eventual runner up Kevin Goodale and picked up his second-straight Mod victory. Victory Lane as something that Ted Christopher saw a lot of on Tuesday night at New Smyrna. 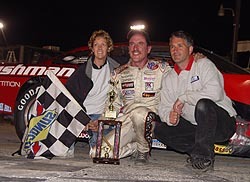 Once TC (#00) got around Kevin Goodale (#58) and JR Bertuccio (#14), he cruised to the Mod win. “I don’t know what happened to Donny,” said Christopher. “I had a good car and I knew it would be between he and I and whoever would get to the front first would have the advantage. I figured he would since he was starting third. I watched him in the warm up laps and saw he was pushing in the middle pretty good. I knew my car was good on the bottom and I could get him because it is hard to pass guys here. We started sixth and passed a few cars. Lia fell out with a broken transmission, the second race during Speedweeks where his car broke while leading. But at the end of the night, easy or luck or not, no one was taking anything away from TC for accomplishing something that is obviously hard to do. TC's Super Late Model has been fast all week, but he's had to fight through traffic most nights. “It is pretty cool to win both races. It is never easy. You always worry. I was one the pole for the (Super Late Model) race and I’ve never won in those cars down here. It is never easy. “It means a lot to me because I love coming here. 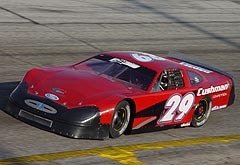 I always like watching those (Super Late Models). I tried my own deal once in those cars. That didn’t work out well. I always said if I could get hooked up with someone real god, I’d like to come down here. We got it done finally tonight. “It means a whole lot to win both here in Florida. It is the first race of the year and everyone is down here. TC now has a commanding lead in the Modified points, and is still climbing up in the Super Late Model point standings. “It is still too early to tell,” said TC of his chances for a Mod championship. “We’ll wait until Friday to see how it goes. We’ve got a pretty good lead, but then you can drop out of a race like Donny did today and it is a whole new deal.